Engel manufacture the world's leading brand of portable car fridge/freezers. A combination of quality performance, durability, low power consumption and consistent reliability make this the only one to buy. Engel provides a 3 Year Warranty on all new Engel fridge/freezers, with spare parts and service being readily available Australia wide. Unique to Engel this purpose built compressor is designed to be a portable refrigeration compressor and is one of the key reasons why ENGEL is 'A LEGEND IN RELIABILITY'. The Sawafuji Swing Motor is a true reciprocating compressor ... it has only one moving part. It doesn't get any simpler. 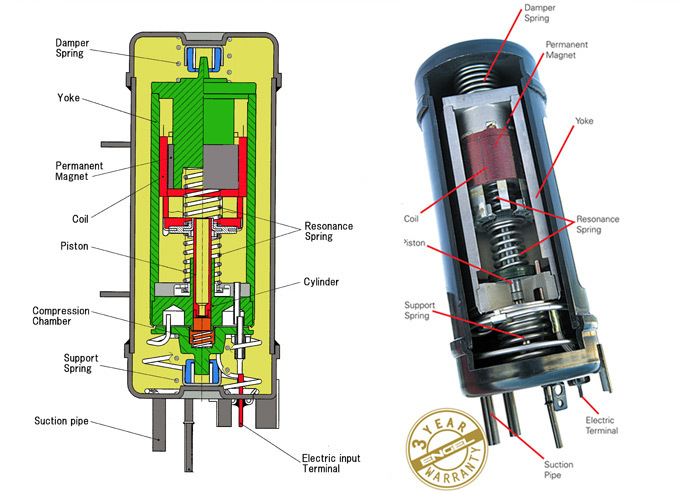 The piston is connected to an electro dynamic device which is powered by the use of magnetic fields. With this technology there is no need for bearings, cranks or con-rods, so less moving parts means less chance of failure. With only one moving part there is a very low friction loss which means this is a highly efficient compressor.